The solution is simple to Save Search results in Windows 10 for example for always recurring search events in Windows 10! It is very easy to save important search request in Windows-10 MS-Explorer. 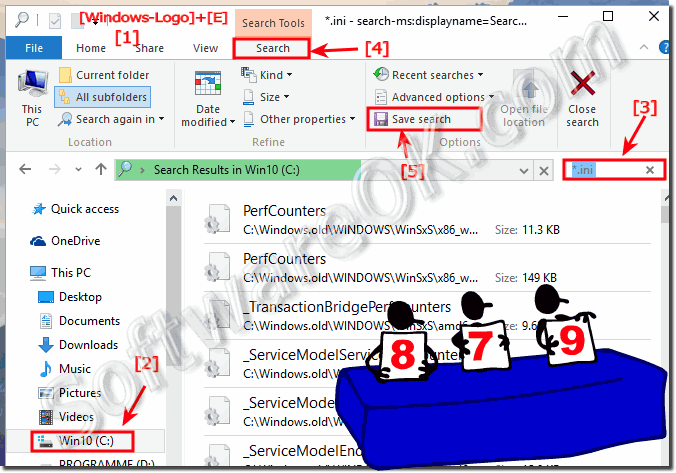 (Image-1) Save Search In Windows 10 MS-Explorer! What does it mean when I see a message that a location can't be searched or there's no media present in the search location? There's a problem searching one or more of your selected locations on Windows-10. Usually that's because you've selected a network location or a device that's not currently connected to your computer. It's also possible that you've selected a removable media device with no media, for example a memory card or a DVD in the device. Check your locations, and then try the search again on Windows 10. You can also use other techniques in the search box to quickly narrow down a search. For example, if you're searching for a file based on one or more if its properties (such as a tag or the date the file was last modified), you can use search filters to specify the property in your Windows-10 search. Or, you can type keywords in the search box to narrow down your results even further. To learn how to use search filters and keywords, see Advanced tips for searching in Windows 10. Windows-10 - FAQ-99: Save search results in Windows 10 for always recurring search events? Save result from pdf search? Saving searches in windows 10? How do I save Search Results in Windows 10? Save searches in windows 10? Saving windows 10 search results as text? How do i save a search in windows 10? Where are searches saved by default in Widows 10? Where are saved searches stored in windows 10? Where does windows save searches? Saving windows 10 search results? Saved searches in windows 10?